The timeless insight of Islam's sacred writings can enrich your own spiritual journey. For many in the West, the teachings of the Qur'an often are enshrouded in mystery and fear. Yet Islam's holy book gave birth to one of the most powerful and enlightened civilizations the world has ever seen. By the sixteenth century, Muslim culture stretched from India to Africa to Europe, preserving with it the ancient learning that helped spawn the Renaissance. With its interwoven ideas of faith and reason, justice and mercy, the path of Islam--which literally means "surrendering to God's will"--offers a uniquely focused and balanced approach to living life with a profound awareness of God. With gentleness and insight, Sohaib N. Sultan leads you through the central themes of both the Qur'an and the collected sayings of Prophet Muhammad, known as hadith. 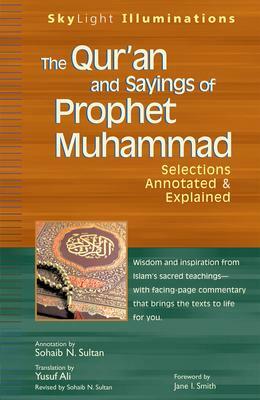 These teachings dispel common misconceptions about Muslim beliefs and offer practical guidance for your own spiritual journey, from understanding the merciful nature of God; to cultivating peace and justice in the self, family, and society; to answering questions about the afterlife and how to attain it. Now you can experience the wisdom of Qur'anic teachings even if you have no previous knowledge of Islam or Muslim writings. Insightful yet unobtrusive facing-page commentary explains the texts for you, allowing you to enter into the path of surrender to God. "A superb guide ... intelligently illuminates each thematically arranged passage and concisely summarizes centuries of Islamic interpretive wisdom." "A comprehensive but accessible introduction.... Assists the reader in grasping the basic issues that underlie the teachings of Islamic spirituality.... Stimulating and thought-provoking, allowing the reader to dialogue with Islamic spirituality at a level very near to lived experience." "Lays before us ... the insights and beauty of one of the world's great sacred texts. A valuable book for any reader who honestly wants to understand the Qur'an and what it teaches." "A clear distillation of Islam's essentials from the sources, this book should prove useful for any introduction to Islam. Recommended." "Takes complex, wide-ranging aspects of Islam and makes them clear and accessible for the non-Muslim and Muslim alike. Comes alive with thoughtfully presented insights and reflections. Whether you have a passing interest in Islam, or have serious questions about this community of faith, you will want to consult [this book]."